Our Awesome October issue hits the shops this Friday! Karen Hayselden is sharing the most stunning Butterfly Ball art panel. Her use of colour is second to none, and what can be more relaxing than sitting down and colouring your stamped images?! One of our ‘giveaway projects’ this month is the gorgeous sewing themed shadow box creation by Ingrid Vichova. All the bits you need to recreate your own box are included in the giveaway, so don’t forget to enter! We’re offering our readers a chance to win the products used in lots of different features, so keep a lookout for them throughout the magazine. Riikka Kovasin shows us that you can never use too many stencils on your artwork in this issue. Her fabulously detailed canvas using six different That’s Crafty stencils is just gorgeous! Our free images this month are four very varied digital designs! We hope there is something for everyone here, from the sophisticated street scene by Jaine Drake to the adorably quirky cactus designed by Magda Polakow! I designed some zentangle leaves that look a bit strange at first glance, but when you see the AMAZING art Keren Baker has created using them, you’ll see just how they can be used! and an inspiring Masterclass featuring real leaves in this issue! We are so pleased to announce the winners of our August Challenge: Take A Technique: Stencils and Masks! We loved this gorgeous card! The wonderful brusho background works so well with the cracke texture of the fern. Beautiful! 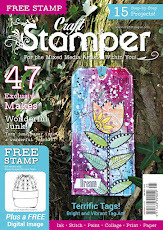 Loll will win a Guest Designer slot here on the blog, her very own Winners Profile, and of course her amazing art will be featured in it's own 2 page spread in Craft Stamper magazine! Congrats Loll! The prize on offer for our randomly selected winner is this set of four stencils! Our September challenge will be launched next Friday, September 2nd. 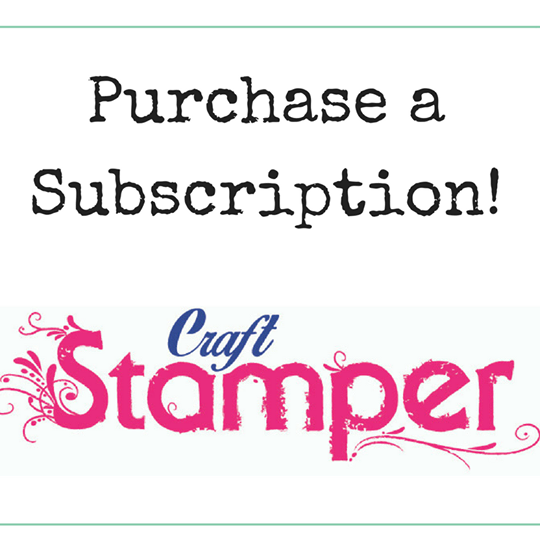 We are looking for submissions for our Ready, Set, Stamp feature on the following theme for our January issue of Craft Stamper. If you've always wanted to see YOUR card in print, now is your chance!! Anne won the challenge with this amazing piece of 3D art! We loved the level of detail in this piece, the stamped beach hut is so summery! A: I started stamping/crafting after visiting a local craft shop demonstration about 9 years ago I have not stopped since! A:My tastes have changed over the last few years, I love vintage, grungy and also shabby chic. It is hard to choose a favourite but I do love Tim Holtz, Wendy Vecchi and also IndigoBlu. A: I don't think I have a 'style' as such so I can only describe it as eclectic – I do love colour and texture and I'll try anything once! I am very messy when creating but I always tidy up afterwards. A: My real passion is creating 3D projects, either designing and constructing them myself or using dies, along with stamps and inks of course! A: That would have to be ink, without that I would not be able to stamp or to colour my projects. Ink is so versatile. Congratulations on being our July Design Winner Anne, and it was lovely to learn a little more about you! Our current challenge 'Take A Technique: Stencils and Masks' is open for a few more days, so still time to enter! Don't forget the fabulous prize of a set of 3 stencils from GiogioCraft is up for grabs! See you back here next Friday, where we will be announcing the winner of the challenge... Good Luck! Show us how unique you can be, create anything your imagination cares to dream up! Share your cards, journal pages, layouts, 3D assemblage or whatever else takes your fancy. Your project can be any colour you want... as long as you've stamped somewhere, and used a stencil or a mask somewhere somehow on your project, then you're good to go! GiogioCraft is run by the very talented Craft Stamper designer Gio Zara! As well as creating stunning art for design teams all over the world, Gio has found time to create her own stunning range of stencils! Welcome to the Craft Stamper August Take It, Make It challenge! Show us how unique you can be, create anything your imagination cares to dream up! Share your cards, journal pages, layouts, 3D assemblage or whatever else takes your fancy. Your project can be any colour you want... as long as you've used a stencil or a mask on your project, and stamped somewhere, then you're good to go! I hope the prizes have given you all an incentive to win...... and how about some eye candy from the DT to give you some beautifully stamped and stencilled inspiration!